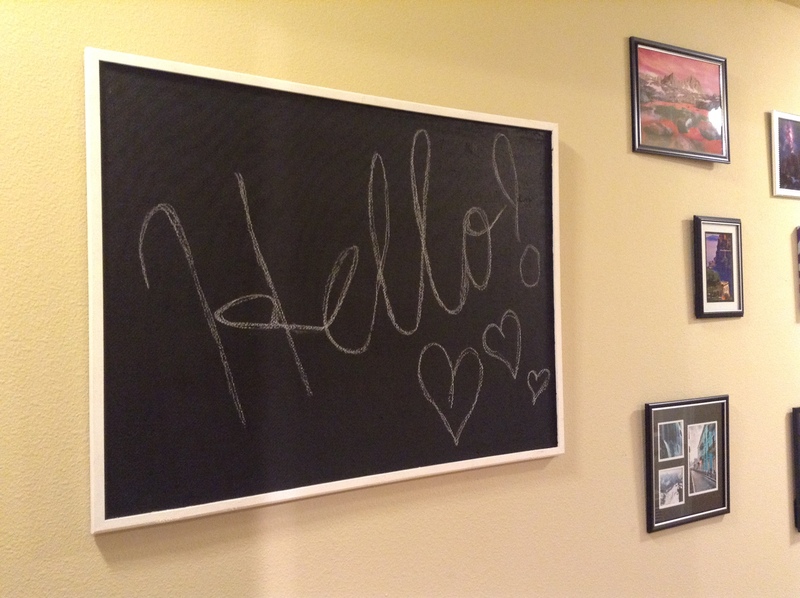 DIY: Turn a Corkboard into a Chalkboard! Anybody else have an old corkboard lying around? Maybe its got some tears in it, dirty, old? Yeah. I had one of those too. So, if you can’t tell, I’m pretty obsessed with chalkboarding everything. I think its genius!!!! So as I was decorating my apartment, I decided I wanted a big ole chalkboard right in the middle of my hallway for us to write on! So instead of buying one, I decided I was going to find a way to turn my old, torn up corkboard into one! 1: First, what you want to do is lay your corkboard on the ground and check it to see if there are any holes in the corkboard where you can see through to the bottom layer. If there are, this is where you will start the next step. If not, start at an edge or a corner. 2: Use your putty knife or scraping tool and dig into the cork layer. Under the cork is a smooth, hard surface that should be some kind of a brown color and have small little TINY TINY holes in it. Dig your scraping tool through the cork until you hit that layer. Then begin to scrape under the cork layer and across the top of the bottom layer. DON’T DIG DOWN after you’ve already gotten through the cork. You’ll just make holes if you do that and it won’t turn out quite as well. 3: Ya’ll, I won’t lie. This kind of took me awhile, but it was worth it for the finished product. But what you have to do is go through and scrape off the cork bit by bit. There will be parts where huge pieces will come off together, so it isn’t as bad as it sounds really!! 4: After you have scraped off your cork, run your hand across the top to make sure its nice and smooth. If it isn’t, use your scraper to scrape off any excess cork. 5: Take your chalkboard paint and foam brushes, and paint across the surface where the cork used to be! 6: Let it dry. It might take you two coats, but chalkboard paint is usually pretty thick and covers most surfaces easily. I used one coat and just touched up parts with a second coat. 7: If you want, you can do what I did and use another color of acrylic paint to paint the edges of your board! 8: ENJOY!! Chalk up your chalkboard!!! What more can I say, Christmas decorations!! This is a super easy craft! Just take your ring and your bows and glue them onto the ring! But first, make sure you have the ribbon attached to your ring so you can hang it up when you’re done! Have fun and glue all of the bows you can fit onto the ring! And voila!! For this one I was inspired by a similar craft I saw on Pinterest (Pinterest is the bomb yall). 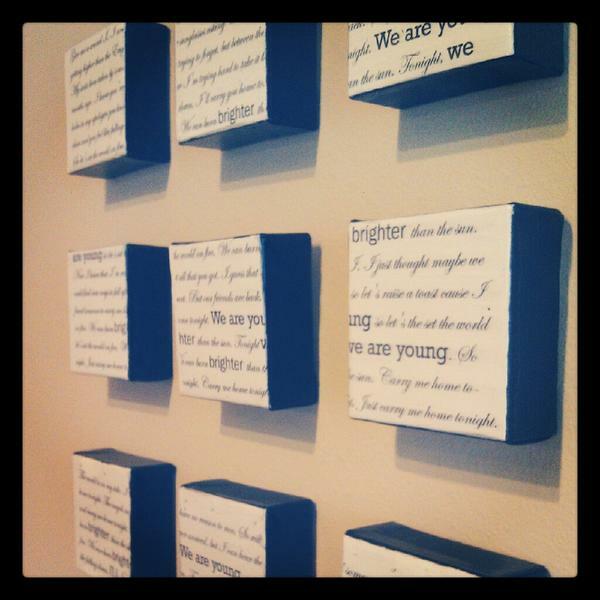 Anyway, the one I saw was awesome, but wasn’t exactly what I wanted and used wooden blocks instead of canvases. I wanted canvases so here it is! So first off, go ahead and paint the edges of each canvas with black paint. You will most likely have to use two or three layers to get a good cover. Once dry, mod podge the edges of the canvases to give the black a nice finish. Next go ahead and pick out a song, I used We Are Young by Fun. Using Adobe Illustrator, create 9 artboards having all of them touching but not overlapping. Size all of the artboards so each is slightly smaller in width and length than the canvases you are using. On word, copy and past the lyrics and format them so the font is what you would like. I varied the fonts throughout the lyrics. Then place the lyrics onto the artboards on Adobe Illustrator. Format them and size them so that they fit well enough that nothing will be cut off at the bottom. Its fine if some of the letters or words get cut off at the edges of the spaces between canvases. Print the artboards out having one on each page to avoid them being cut off. Cut out each meticulously. Once cut, mod podge each onto a canvas. Let dry, then layer mod podge on top to finish. I kind of went Christmas crazy this year. LOVE CHRISTMAS. Just saying! So this is really pretty straightforward. 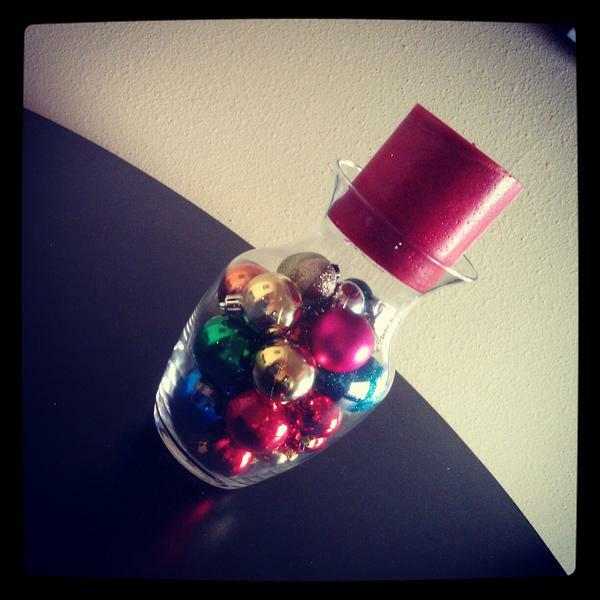 All you have to do here is fill the vase with ornaments and plop the candle on top! Pretty cute right?! I love this one. Not gonna lie! It turned out pretty cute! So for this one I had bought two canvases in a pack for a great deal and had no idea what to do with them! Then this idea came to me! So I thought I would share it. Find a quote! When you have your quote, type it out on Word and put it into the font you want! For this one you will have to play around with font sizes and perhaps print them a few times to get the right size! 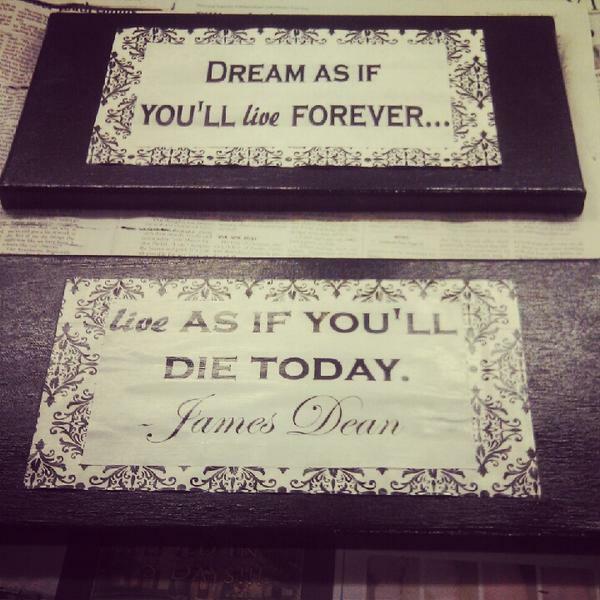 Split the quote into two parts, one part for the top canvas and one for the bottom canvas. Then go ahead and print them out when you have them finished! 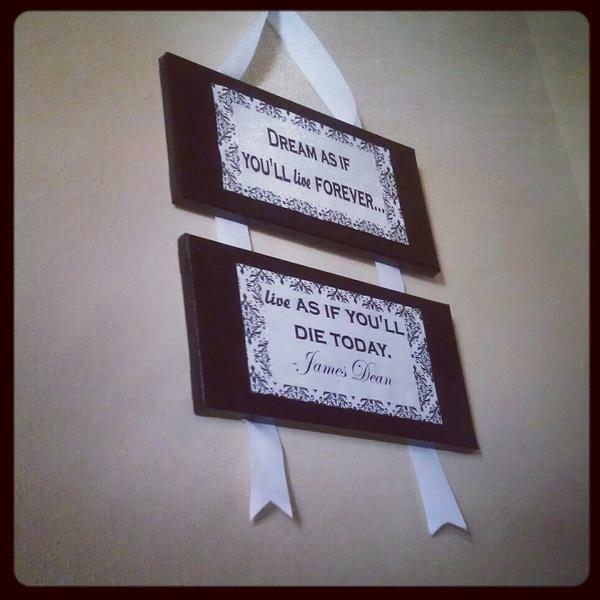 Cut out your quote from the printer paper to fit the scrapbook paper the way you would like. My quote was slightly smaller than the scrapbook paper in order to have the scrapbook paper serve as a border to the quote. Paint the black paint onto the canvases covering them thoroughly and completely. Let dry then paint a coat of mod podge on top, I used glossy but you can use matte if you would prefer. Mod Podge the quote onto the scrapbook paper. Make sure its nice and straight and centered! Then mod podge the scrapbook paper onto the canvases centered on each! For this part, I found that the scrapbook paper I used was a bit thick so it lifted at the edges. If this happens to you, you can do what I did and use a hot glue gun to glue the edges down. Once all of this is mod podged down, use mod podge to go over all of them and create a nice finish to it all. Let it FULLY dry!!!! 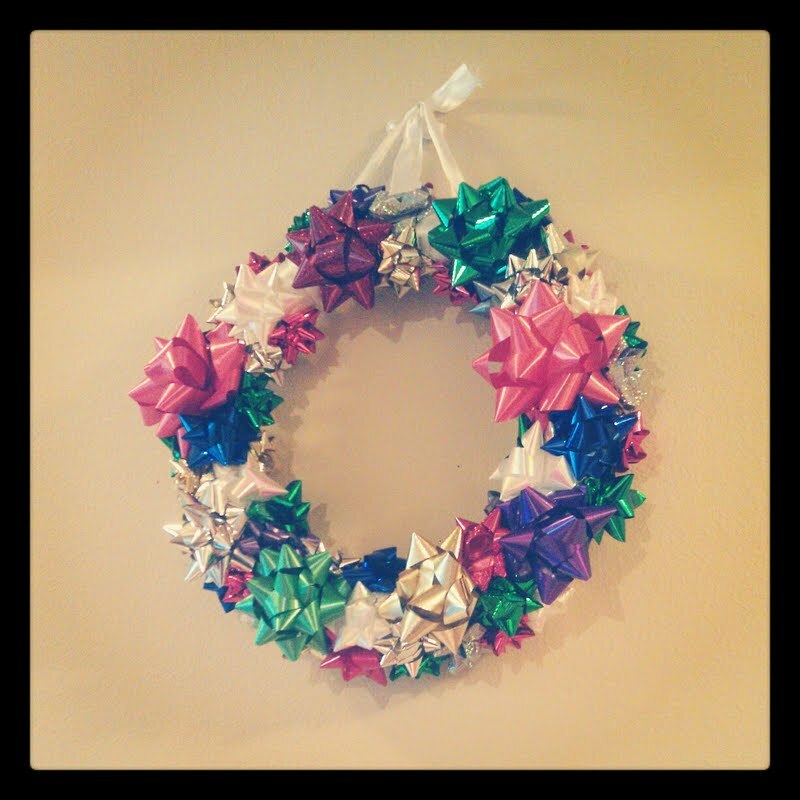 Then flip it over and lay out your ribbon leaving plenty of dangle room for it to hang! This is important, make sure it is 100% dry on the front, if not, it will stick to anything it touches and will probably ruin your work if it does. When you have your ribbon laid out perfectly, either hot glue or staple the ribbon into the wooden edges of the canvas. Don’t skimp on staples, if you do it will hang awkwardly, make sure you use lots to ensure its hanging straight and firm!! And you’re done!